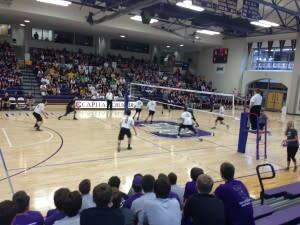 The Knights of Archbishop Alter sure seem to like playing at Capital University. “I love this place, it’s a central location and they put on a fabulous event,” said coach Craig Erford, minutes after his team topped Walsh Jesuit to win its third consecutive Division II Ohio High School Boys Volleyball Association (OHSBVA) State Championship. Elder High beat Archbishop Moeller to win the Division I title and put an exclamation point on a great weekend of volleyball action at Capital. The eight Divison I and four Division II teams that advanced to the state tournament featured scores of talented players who have helped put Ohio on the national volleyball map. “There’s no doubt there’s a lot of talent here, the growth has been huge,” said Kevin Burch, an assistant coach of the Ohio State men’s volleyball team, who recently won the NCAA championship. The Buckeyes had one Ohio player on their roster, a situation that is changing. Dejon Clark of Pickerington North has signed with Ohio State and “we’re here looking at another player,” Burch said. Pickerington North lost in the Div. I state quarterfinals. Local power Hilliard Darby lost in the Division I semifinals to Moeller 22-25, 25-19, 24-26, 25-23, 15-11 in the most exciting match of the weekend. Burch credits Hilliard Darby coach Bryan Webb with helping to ratchet up the talent level. The best is yet to come, said Gary Hajek, executive director of the OHSBVA, a well-organized group who really do know how to host a great tournament. “We have eight new teams this year and a total of more than 80,” he said, adding Columbus, Cincinnati and Dayton are the state’s hotbeds for volleyball. 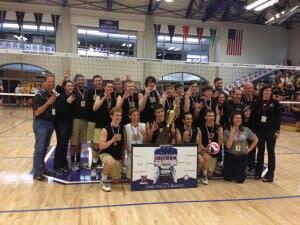 The goal is for the Ohio High School Athletic Association to sanction boy’s volleyball and host the state tournament. And that day, Hajek believes, is coming soon. “We’re in a great position to get sanctioned by the OHSAA,” he said, adding the Ohio Valley Region (OVR) of USA Volleyball has led the way, introducing the sport to thousands of boy’s and girl’s youth players. The OVR has more than 20,000 members and hosts massive regional and even national tournaments every year at the Greater Columbus Convention Center. The NCAA Division I Women’s Volleyball Championship will be held at Nationwide Arena in December. “All the facilities and equipment, the officials and coaches are already in place,” Hajek said. The quality of the coaching across the state has been a key driver for the growth of boy’s high school volleyball, Burch said. “That’s the main reason the sport continues to grow and the players are getting so much better,” he said. This was the second year the OHSBVA held its state tournament at the Capital Center Performance Arena. About 4,000 people attended the matches on Saturday and Sunday, and the live webcast of the games got about 30,000 hits. Hajek is optimistic the OHSAA will soon sanction boy’s volleyball and he can already envision it’s first boy’s volleyball state championship. “I can see it at St. John Arena (on the Ohio State campus) and it will be great,” he said.